This post is part of the Big RESP Series. See the entire series here. See the previous post on resp withdrawals here. When setting up a resp account it’s important to determine and monitor the asset allocation of the account. Typically the asset allocation is determined by the risk profile of the investor and the amount of time remaining until the money is required. Equities are considered risky assets but over a longer term they are fairly reliable. If you are making an investment and you need the money in two years then equities are not advisable because there is too much risk that their value will go down over those two years. Short term bonds or a high interest savings account is a better investment for money that is required in the short term. The idea is not get superior returns but to ensure that the money is there when needed. So if equities are a good investment over the long term but not the short term, the question has to be asked – how long is the “long” term and how short is the “short” term. I would say that short term is anything less than five years and the long term is 15 years or more. Please note that this is strictly my opinion so don’t write it in stone! Unlike retirement planning where you don’t know how long the portfolio will be in use for, RESP planning is a bit easier since you can make a pretty good estimate of the start date of withdrawals and the end date of withdrawals. For this example I’ll assume that the student goes to school starting the year they turn 17 and finish up four years later. Once they are starting school all the money will be withdrawn within five years so it should be in very safe securities such as high interest savings accounts, short term bonds or money market funds. I would invest equally in Canadian, US and EAFE for the equity portion and in short term bonds ETF or a bond index fund for the bond portion. You can add other asset classes to the mix as well. This example is intended to show a simple asset allocation. I’ve indicated the allocations at five or six year terms. If you are really keen and plan to rebalance every year then you can also adjust the allocation every year. Obviously none of the above allocations are perfect for every investor so try to keep in mind the idea that money which is required in the short term should be invested in safe investments and try to adapt the above suggestions to your situation. 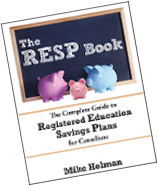 See the next post on RESP Individual and Family Plans. This is almost my exact plan. I have a 2 year old son (and a 6 year old daughter, but her pan is with CST . . . YUCK) who I have in equities. I’m planning on moving 10% per year in to safe investments when he turns 8 so that when he is 18 it will be protected. It seemed like a good plan when I came up with it, I’ll have to wait until he goes to school to find out though I guess. Hi Traciatim – it’s good to hear that my asset allocation suggestion are not too far out in left field! You can analyze asset allocation until the cows come home (and I have done this) but picking a simple couch potato type strategy works pretty well. Good post. Looks like a reasonable approach to me. If you have more than one child you can extend the asset allocation time period through the university years by having a joint plan. Since it will likely cost more for university than the RESP will contain, you can leave the withdrawals till later and gain longer tax-free growth … if you are pretty sure the last child will go to university. My three children have been one or another continuously in university for the last seven years, for instance. If you can contribute every year to the RESP – a good idea to obtain the federal grant – then it might be possible to accomplish a lot of the rebalancing simply by investing the new money in the right type of asset. I know its an old post but I found it very helpful. I’m working on creating a RESP autopilot spreadsheet which shows our kids will be fully funded in just 5 more years, but I forgot to adjust the yearly returns at the end to melt down the equities into bonds. Also I’m starting with the mini sleepy portfolio’s 80/20 equity/bond split, which will melt down to 10/90. My son started university in Sept. We withdrew $5000. $2600 in grant and $2400 in growth. I want to withdraw more as his next tuition is due, but do not want to have to pay tax on it. He can claim tuition, textbooks($65 x 4months), education ($400 x 4months). Need help figuring out how much more I can withdraw. Is it better to withdraw all the grant he had $5800 total in grant money . Is the grant money taxed at 20%? I would appreciate any help as everyone I talk to gives a different answer. Brenda, I don`t know why you would pay any tax in your situation. All grants and earnings are taxed in your son`s name. The 20% tax only applies if you are collapsing the resp and he doesn`t go to school. There is a limit of $5k withdrawal of earnings and grants in the first 13 weeks but you can remove any contributions you like. The point of an RESP is when you take money out for education expenses it is taxed in the hands of the student, not the parent. So in most cases you would pay no taxes at all. I think the 20% tax Four Pillars is referring to is if you collapse the plan without ever using it, but even if you do collapse it unused I think the tax can be avoided if you just roll the RESP contributions over into an RRSP, assuming you have unused room left. RespedOut – yes, on the “earnings” portion (which doesn’t include grants since they get taken away) you pay your marginal rate + 20% which in your case would be 60%. As Jordan mentioned – if you can roll it into your rrsp (or your spouse’s rrsp) then you will avoid the 20% special tax. You won’t pay any tax on it until it is withdrawn – at that point it is just normal income. Now that I think about it – I wonder if there are rules about how long the money has to stay in the rrsp to avoid the 20% tax? ie if you make a spousal rrsp contribution and then withdraw the money within 3? years then it gets taxed at your marginal rate – not the spouse. I’m just thinking that if there isn’t any similar rule for RESP to RRSP transfers then you could do the transfer to the rrsp and then withdraw from the RRSP. You would still pay the normal income tax but you would avoid the 20% hit. I’ll have to look into this. We’re about to start a Family RESP with Questrade, mainly because it allows us to buy gold, but also for the reason of keeping our investments self-directed. Anyone aware of any restrictions or limitations the government might have when contributing the CESG to commodity-holding accounts? A financial advisor from RBC recently told us (non-specifically) the government won’t contribute the grant to certain types of RESP accounts and I’m wondering if this was they type he meant.